The Legendary Starfy series, known in Japan as the Densetsu no Stafy series (Japanese: 伝説のスタフィー シリーズ) is a video game series developed by TOSE and published by Nintendo. The series is about Starfy (Japanese: スタフィー), "a legend" who is the prince of a kingdom high above the ocean, above the clouds called Pufftop. Joining Starfy's adventure is Starfy's best friend Moe and after the events of Densetsu no Starfy 2, his younger sister, Starly. In all five games, something causes Starfy to fall into the ocean and fight evil. So far all of the Starfy games have been released exclusively for handheld platforms. The games are officially known as "Marine Action" (Japanese: マリンアクション) games due to a good portion of the game taking place underwater, although not all stages in the games are set underwater. There are occasionally platformer elements in the series, and the official English Nintendo mini-site, as well as the Nintendo of Australia mini-site, lists the latest game in the series, The Legendary Starfy as a platformer game. Gameplay generally involves Starfy and/or his younger sister, Starly, solving the problems of other characters while defeating enemies and bosses on their quest in bringing peace to Pufftop, or in the Nintendo DS games, another kingdom, including the Amiy Kingdom (Densetsu no Starfy 4) and Planet Bunnera (The Legendary Starfy). The Legendary Starfy series originated when Nintendo producer Hitoshi Yamagami was asked by his boss to come up with a kind of 'floaty platformer'. Later, he worked together with TOSE producer Yasuhiro Minamimoto and the end result, Densetsu no Starfy, starred Starfy; a starfish like creature with traits of a celestial star. The first game in the series, Densetsu no Starfy was originally meant to be released for the Game Boy Color. A trial demo of the Game Boy Color game was shown at Nintendo Space World 2000 but development later moved to the Game Boy Advance. Various changes were made during the transition for example, the Japanese name of Moe changed from "Kyororon" to "Kyorosuke". Due to relatively good reception of the game, four sequels were released which include Densetsu no Starfy 2, Densetsu no Starfy 3, Densetsu no Starfy 4 and The Legendary Starfy. There are numerous The Legendary Starfy series merchandise sold to promote the series, such as stuffed toys and CDs. Mangaka have also worked on manga about the series. In an interview with Nintendo and TOSE in 2009, Hitoshi Yamagami suggested that there are plans for a sixth Starfy game in the series. When Hitoshi Yamagami was asked by Nintendo Life whether are "any plans for a sixth Starfy title in the works? ", he replied "Yes!" with a long pause and then a laugh. However, no further information has since surfaced about the game. The first issue of the Densetsu no Starfy (Japanese: 伝説のスタフィー) manga series by Yumiko Sudō, published by Shogakukan. There have been two series of The Legendary Starfy series manga collated in tankōbon form. The first series, simply known as Densetsu no Starfy was based on the events of Densetsu no Starfy, Densetsu no Starfy 2 and Densetsu no Starfy 3. 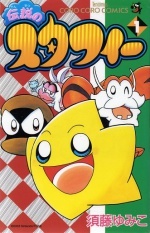 It was frequently submitted to issues of CoroCoro Comic from June 2002 (before the official release of the game Densetsu no Starfy in June 2002) until October 2005, and it was illustrated by manga artist Yumiko Sudō. The manga was published by Shogakukan and Nintendo and TOSE own the copyright to the tankōbon. The second series, known as Densetsu no Starfy R (Japanese: 伝説のスタフィーR) ran from April 2006 until April 2008, and it was illustrated by Suzuo Yadaka (Japanese: 矢高鈴央, やたか すずお) as a follow up to the original Densetsu no Starfy manga series based on the events of Densetsu no Starfy 4. Densetsu no Starfy R is an abbreviation of Densetsu no Starfy Returns (Japanese: デンセツノスタフィーリターンズ). Like the first series, it was published by Shogakukan and submitted to CoroCoro Comic. Nintendo and TOSE own the copyright to the tankōbon. Included in the November 2008 issue of Enterbrain's Video Game Magazine is a small manga called Starfy's Adventure (Japanese: スタフィーのぼうけん) based on The Legendary Starfy, as well as three manga included in the magazine itself called Defeat the Enemy!, Hidden Room Discovery! and Combined by Transformation!. Although there are currently 5 games in The Legendary Starfy series, The Legendary Starfy (Densetsu no Starfy Taiketsu! Daiiru Kaizokudan in Japan); is the only game to have been localized and officially released outside of Japan. Nintendo of America officially localized The Legendary Starfy and released the game on June 8 2008, just over a year from the Japanese release and one day earlier than scheduled. Nintendo of Australia later released and produced the game in Australasia in October 2009, although currently no other branches of Nintendo have officially released the game elsewhere. In March 2019, unreleased but official Chinese versions of Densetsu no Starfy and Densetsu no Starfy 2 were leaked to the public. These were reportedly intended for the iQue editions of Nintendo hardware (likely the iQue Game Boy Advance), which are Chinese equivalents to the English hardware. In China, the series is known as Sitafei De Chuanshuo (Chinese: 斯塔非的传说). Nintendo of America appear to have no plans of localizing past games in the series. In a 2009 conference call set up by Nintendo between Nintendo Life and six developers of The Legendary Starfy, producer Hitoshi Yamagami joked that the reason why Starfy took so long to debut in the US was that he 'was swimming all the way from Japan' and explained that the series was always developed for a Japanese audience. The developers stated that they always wanted to bring Starfy to the US, but that Nintendo of America deemed the games 'too Japanese' for American audiences. In fact, various elements of the games such as certain Items and Stuff are full of Japanese cultural references. Hitoshi Yamagami, however, stated in the conference call that although TOSE had no intention of releasing the previous The Legendary Starfy series games, the possibly of releasing them exists "if Starfy proves to be a huge hit and fans demand that they have the first four Starfy games". According to Yasuhiro Minamimoto, the development team were conscious of the sales of The Legendary Starfy from the planning stage, so he feels that is why the game made it out of Japan. Despite this, there are various localization changes in the fifth game, where for example the manga style cutscenes in Densetsu no Starfy Taiketsu! Daiiru Kaizokudan were changed and made to read from left to right instead of right to left. The Legendary Starfy was registered as a trademark by Nintendo of Korea, but no games in the series have been released there. Please note, the ordering may not be accurate chronologically. The patent below was registered in 2006, even though its image is based on Densetsu no Starfy's logo. The manga logos are taken from their tankōbons when applicable, but it's possible that a black and white version was shown at an earlier date in the publication it was originally shown. Nintendo Space World 2000 and 2001 logo. Japanese patent image (search 'スタフィー'). Densetsu no Starfy (Sayori Abe) manga logo. Densetsu no Starfy (Yumiko Sudō) manga logo. Densetsu no Starfy 2 logo. Densetsu no Starfy 3 logo. Densetsu no Starfy 4 logo. Densetsu no Starfy Taiketsu! Daīru Kaizokudan logo. Densetsu no Starfy R logo. ↑ List of manga appearing in Shogaku Third Grade (小学三年生) (in Japanese). ↑ List of Shogakukan Grade Comics manga on AnimeComic-Cell (in Japanese).